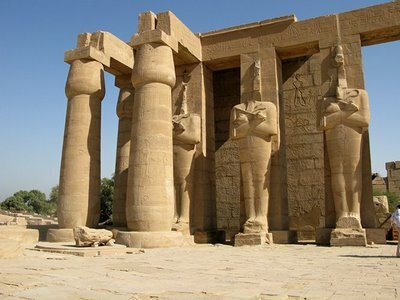 Djedu: Busiris, the Lower Egyptian cult centre of Osiris, in the middle of the Nile Delta. There’s not much to see there now. But the hieroglyphs in its name bear some investigation. pronounced – wait for it – djed. Waaaay back in the mists of the Predynastic period, the djed pillar was a sizeable cult object, something like a totem pole. It appears to have been a tree trunk with sheaves of grain bound to it to give it its distinctive shape. If you think it has a certain vertebrate quality, you’re right. When Seth chopped up Osiris’ body and scattered his forty-two limbs the length and breadth (such as it is) of Egypt, Busiris got his backbone. Osiris, as you’ll remember, was an agricultural god, who taught farming while he was alive and was resurrected in the growing corn after he was slain and had fallen. So his Lower Egyptian symbol, the djed pillar, is a kind of gigantic backbone made of corn. Whether that was how the Egyptians understood it in the early days, who knows – but that was what it came to symbolise as the milennia rolled on. The djed pillar or backbone of Osiris was a powerful magical symbol and represented stability, endurance, everlastingness. In the form of an amulet, it conveyed everlastingness on the owner, alive or dead. Djed pillars are very common in Egyptian art, from tiny beads to unwieldy cult objects. Now I’ve shown you a few different versions, you’ll be seeing it everywhere. It’s not difficult to draw; a central column, rounded at the top and flaring out into a base at the bottom, and then just draw four straight horizontal lines across the top. Whether the ultimate symbol of stability is appropriate for a redundancy leaving card, I leave to your own judgement. See his downy body and his little wing? A pity the artist/scribe hasn’t given him an eye, but there may be a (magical) reason for that, as this one comes from a tomb. When you draw yours, start with his beak and rounded head, go down his back and turn the corner of his tail, come up under his belly and around to his beak again. Or something like that, but draw the outline, anyway, Then add on his two little stick-like legs and make sure you put in a baseline for him to stand on. 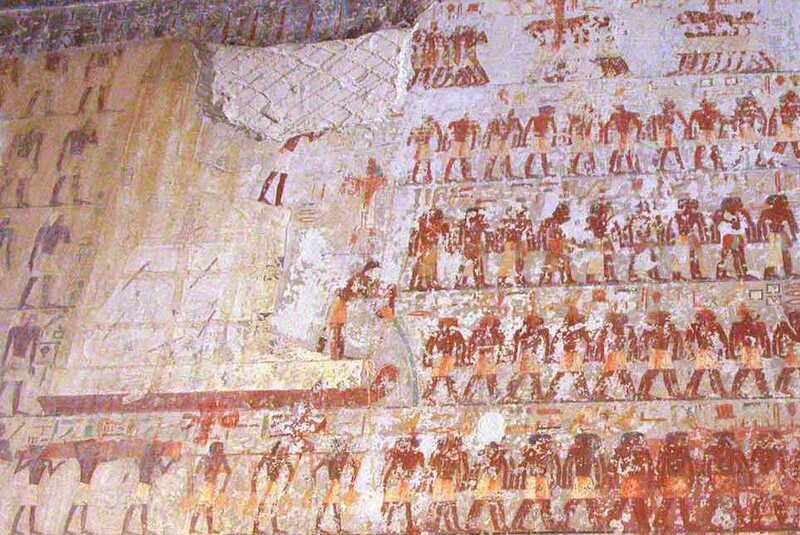 The Egyptians liked to have their animals and people standing on the ground. They didn’t like them hovering in mid-air. In any case, he can’t fly yet, he’s only a chick. Then you can dot his eye and give him a little curved, featherless wing. Ah bless! 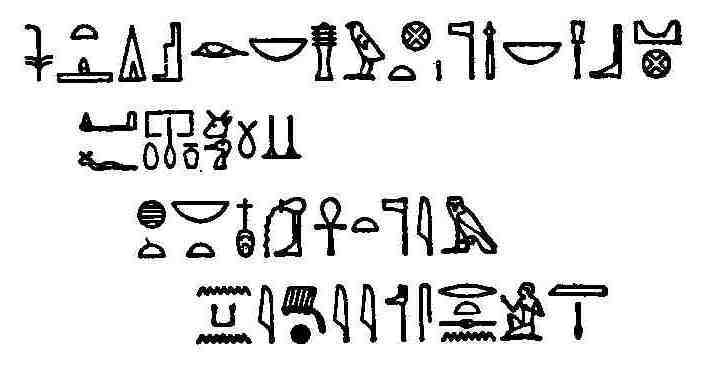 Hang on, you’re saying, we’re only two hieroglyphs into the word and we’ve already got the sound Djedu. We seem to have a lot of signs left over. In this word, the city sign is not just a determinative; it has a phonetic value, niwe. You can see our old friend the loaf of bread t completing the word. The final stroke is a kind of determinative that conveys the idea “one of these” as opposed to two or three strokes, which mean the dual or plural form of the noun. Or sometimes it’s just a filler. So it looks as though, when the scribe or artist got to the determinative of Djedu, he followed straight through into the word for town or village: Djeduniwet; Busiriston, maybe. Thank god he didn’t have to spell banana.